CW5 Charles A. 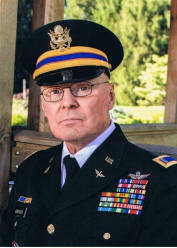 “Chuck” Adkinson III (US Army, Retired), 66 of Marysville died Saturday, May 17, 2014 at his residence with his devoted wife at his side following a 21-month journey with cancer. A husband, friend and Master Army Aviator, Chuck conquered life and inspired all who knew him with his courage, humility, and zest for life along the lines of excellence. He enlisted in the US Army on December 14, 1967, and retired from the Ohio Army National Guard on his 60th birthday following a stellar 40 year career. He bravely served as a combat helicopter pilot in Vietnam where he was awarded the Distinguished Flying Cross, the Bronze Star and numerous Air Medals, and later served a deployment to the Middle East during The Global War on Terror. Always modest, Chuck was admired for his professionalism, dedication, loyalty, and bravery by those that had the honor to serve and fight beside him. He was a 1966 graduate of Dayton Chaminade High School, attended The Ohio State University, and received a Bachelor’s Degree from Capital University. As a civilian, Chuck served as an international corporate pilot for AEP and Borden, among others. He attended Our Lady of Lourdes Catholic church and was a member of American Legion Post #79, VFW Post #3320, Vietnam Helicopter Pilots Association, and the Vintage Drag Bike Racing Association. Chuck appreciated vintage motorcycles and sports cars and restored several through the years. He was a compassionate animal lover and often brought home stray dogs and cats to care for. More than anything, he was a loving husband and the type of friend we should all be so lucky to have. He was born March 24, 1948, in Toledo, the oldest of 8 children, to the late Charles Alton Jr. and Dorothea (Ferguson) Adkinson. He was preceded in death by his sister, Suzanne Kromer. Survivors include his wife of 22 years, Susan Orr Adkinson; his siblings, David (Jean) Adkinson, Patrick (Debbie) Adkinson, and Teri (Terry) Buchanan, each of Beavercreek; Dianne Adkinson, Dayton; Philip (Vickie) Adkinson, Cincinnati; and Steven Adkinson, Dayton; many nieces and nephews; and countless friends. A Mass of Christian Burial will be celebrated on Friday, May 23, 2014 at 11:00 A.M. at Our Lady of Lourdes Catholic Church. Father David Poliafico will officiate, and Military Rites will be conducted by the Ohio Army National Guard. Burial will take place at a later date at Arlington National Cemetery, Washington DC. Friends may call from 2-4 and 6-8 P.M. Thursday, May 22, 2014 at Mannasmith Funeral Home, Marysville. Memorial contributions may be made to the Union County Humane Society. Condolences may be expressed at www.mannasmithfuneralhome.com.